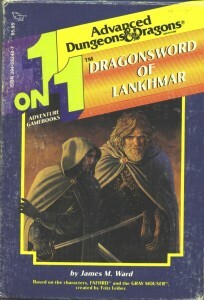 A while ago, I wrote an article on buddy adventure in roleplaying games — loosely defined as two characters alone against a sea of troubles. Swords and deviltry, to put a very fine point on it. How can we build a fantasy adventure game which takes two heroes, two players, and sets them against the world with only their wits and their swords? Something that really captures the action of a Fafhrd and Mouser story? To quickly recap my earlier post, the necessary elements of buddy adventure1 are push and pull. Internal pull is made up of the common traits that keep the two heroes together. External pull is what draws the characters through the adventure — the prize(s) they seek. Internal push is the contrasts and competition between the two characters. External push is the trouble that manifests during the adventure. So, our game needs to encode each kind of push and pull into the story. Characters (and players) need to both cooperate and compete (teaming up and trying to top each other in feats of daring), while facing adversity heaped upon them (by such things as evil priestesses and dastardly wizards). 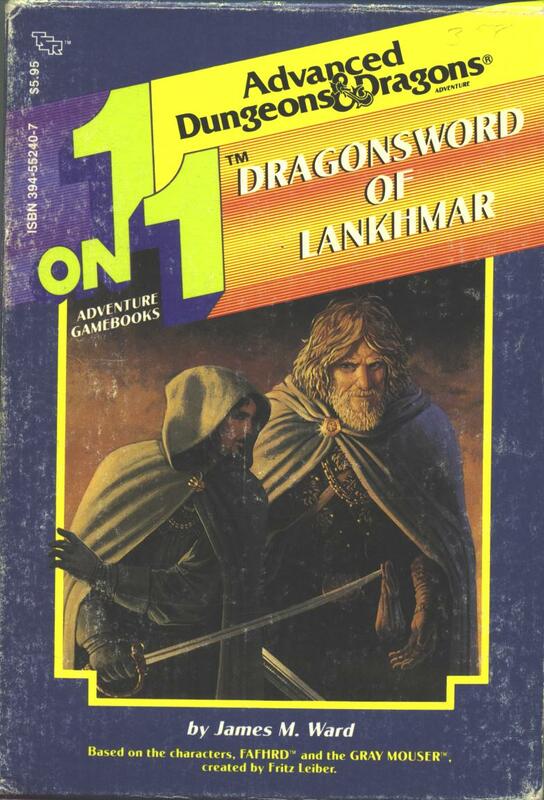 I’ve always been a big fan of the introductory scene in The Swords of Lankhmar, where Fafhrd and the Mouser alternate describing the scene before them, and Leiber seamlessly segues into a great action sequence. Let’s make that kind of riffing back and forth the basic rhythm of our game. We’ll start with a core mechanic, as the core of the adventure is the aforementioned feats of daring. Let’s offer a mechanical advantage for describing them, a la Wushu. When you describe your hero performing a feat of daring, take a red die. The most effective source of adversity is another player — this is the origin of the traditional GM. With two players and no GM, let’s encourage the players to create adversity for each other’s heroes. Let’s make this a details-for-dice situation as well. When you describe a difficulty for your partner’s hero, give your partner a black die. Obviously, red dice should help your hero. Let’s say that they contribute to resolving a conflict. Each red die that comes up higher than a target number reduces the conflict’s “hit points” by one. Each red Success reduces the scene’s Challenge Rating by one. Less obvious is how the adversity should work. In order to prevent players from either being total jerks or total softies, we need to make players glad to receive adversity. Well, red dice do “damage” to the conflict, right? So let’s give the conflict the ability to do damage in return. We’ll make red failures (“Misfortunes”) deplete our heroes’ hit points. A red Misfortune takes away one point of a hero’s Luck (the hero’s ability to dodge trouble and stay in the conflict). That means that every heroic action carries the risk of mechanical adversity. So let’s have our black dice mitigate that adversity, effectively converting mechanical adversity into narrative adversity. Each black Success cancels one red Misfortune. On your turn, take a red die or give a black die. …and make sure that dice get rolled every so often, so that we don’t end up with a giant pile to be rolled at the end of the scene. When you and your partner have each taken or given a total of three dice, roll your accumulated dice. You have three turns in a round. Describe a bold action for your hero and take a red die. Describe a nasty complication for your partner’s hero and give a black die. When both you and your partner have taken all of your turns, roll your dice. Each die 1-3 is a Misfortune. Each die 4-6 is a Success. Each red Success reduces the Challenge Rating of the scene by one. Each black Success cancels one of your red Misfortunes. Each remaining red Misfortune reduces your hero’s luck by one. We now have a core mechanic for push and pull between two players. Players are rewarded for both describing bold actions for themselves and narrating trouble for each other. Next, we’ll look at tying this to scene framing. Having seen an earlier stage in development, I think I missed the “ah, how many times do you roll?” question. Your playtest comments were quite helpful. I’m taking the opportunity to build this out in public; I’ll be reporting on the playtesting process as well. I’ve been failing to make a decent two-player, shared-GMing RPG for a while (I don’t think RPG design is my strong point). I am naturally eager to see how To Seek Adventure turns out, because it could be exactly what I am looking for. A question, though. You describe two options: describe something bold for a red die (external pull), or give a black die for a complication (external push). What about the internal pull and push? How do the mechanics show what keeps the characters together? How do their differences strengthen or weaken them? Is that a red die, a black die, or both? Isn’t it _internal_ push that drives the characters to greater feats, and _external_ push that causes them to fail? I’m sure you’ve thought of this, but there seems to be a bit of dissonance between the intention and mechanics of black dice. If you have “I swing across the chasm on the vine!” and “The vine breaks and you almost fall to your death!”, it sounds like the second person is sabotaging, rather than helping. Do playtests show this to be an issue? Finally, some food for thought. Have you thought of having red as external and black as internal, with success=pull and failure=push? So for instance, if I do something bold, that’s external. If it is success/pull, it is a heroic action; if it is a failure/push, it is a complication. If I interact with my fellow character, that’s internal. If it is a success/pull, I have spurred my companion on; if it is a failure/push, I have only distracted him, or achieved nothing.